These app-filled days we live in just got, well, more filled as Android and Windows Phone 7 both crossed significant milestones. Android's relentless pursuit of Apple's App total continues unabated as it has now got (albeit unofficially) 200,000 apps locked into the vaults of the App Market. 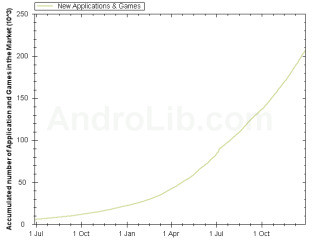 The stats come from AndroLib, which documents the number of applications and games downloaded from the portal - although this number sometimes comes into conflict with Google's reported totals. It's good news for Microsoft too - Windows Phone 7 now has more than 5,000 apps on its books in less than three months, and the rate of development appears to be increasing. The better news for the Redmond bunch - the total is already closing in RIM's BlackBerry World, and nearly 75% of the apps downloaded are paid for, meaning a siginificant wad of cash for Ballmer's Brigade. However, it should be noted that WP7 offers a comprehensive trial service, so while a lot of 'paid' applications are being requested, it's likely a lot are only on trial and won't be upgraded to the full price version. It's interesting to note the shift in user behaviour too: Microsoft's mobile experience has been built on business and productivity, yet only 7% of all apps downloaded are from this category - gaming is the big winner with 22% at the moment, so has the consumer experience taken the lead?